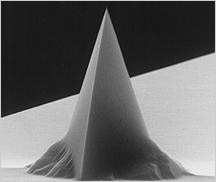 NanoWorld Pointprobe® NCST AFM probes are designed for non-contact or soft tapping mode imaging. The combination of soft cantilever and fairly high resonance frequency enables stable and fast measurements with reduced tip-sample interaction. Thus, tip and sample wear could be significantly decreased. Additionally, this AFM probe offers a typical tip radius of curvature of less than 8 nm.